Hardware startups seem to gradually be taking over the world. Thanks to the lower costs of developing and prototyping new products, it’s easier (and cheaper) than ever before to build devices that can be used in the real world. That said, some startups could use help in the promise, which is what hardware accelerator HAXLR8R seeks to do. Shenzhen-based HAXLR8R specializes in helping hardware startups, and is focused on taking them all the way from idea to prototype to finished product. It does that by leaning heavily on its local surroundings — HAXLR8R is based in what some might call the electronics capital of the world. This is the accelerator’s third demo day, and HAXLR8R co-founder Cyril Ebersweiler says that each successive class has gotten better than the last. It’s got everything from a “bionic mattress” for premature babies to a gadget that lets you play with their pet from anywhere with a smartphone. There are 15 million premature babies born every year, which spend about 21 days on average in an incubator. BabyBe is a bionic mattress for premature babies that’s designed to replicate the haptic conditions of a mother’s chest. By doing so, the team believes it can stimulate growth within the babies and also improve brain development of children during their time in an incubator. There are two components to the system — there’s the bionic mattress which the baby lies on and it provides feedback from the mother’s body and let the baby feel like it’s near a loved on. 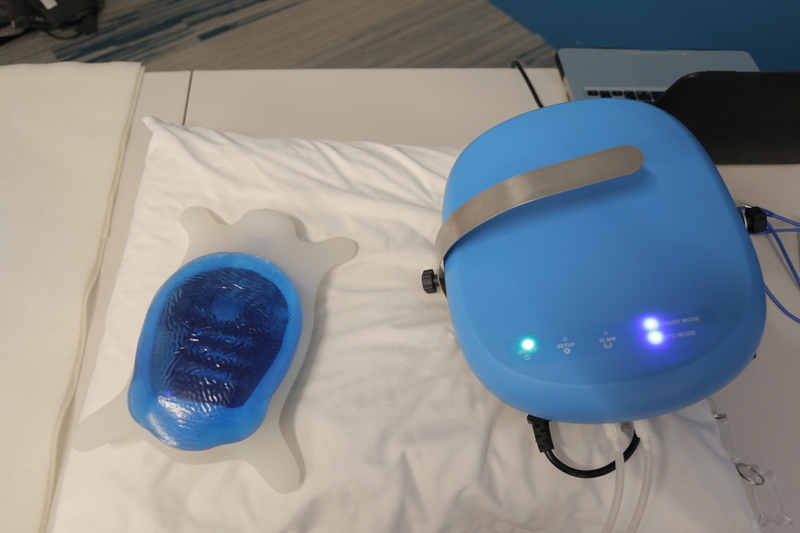 Then there’s the “turtle,” which is a product that the mother can cradle and get feedback from the baby’s movement and heartbeat. With those tools, it believes it can reduce the time a child spends in an incubator and save parents and the healthcare system money as a result. Curio is an interactive animatronic toy platform that are brought to life by connecting with a tablet or mobile phone. Curio characters are open source and hackable, so that anyone can build their own with a 3-D printer. The company is looking to build a new generation of toy that’s emotive, educational, and fun to play with. Curio characters clip onto a screen to instantly connect. Instead of using Bluetooth, the toy works by having light signals sent to it. For Curio, the goal was to build maximum expressiveness with cost-sensitive components. Introducing the smartphone or tablet enables that. The company sees the possibility for branded toys that can be built by others, with a mass-market toy. But in the meantime, it’s looking to target makers and character designers who could build their own 3D-printed toys. The app gives users a series of movements and sounds that the Curio characters can use, as well as a timeline for them to build their own stories. 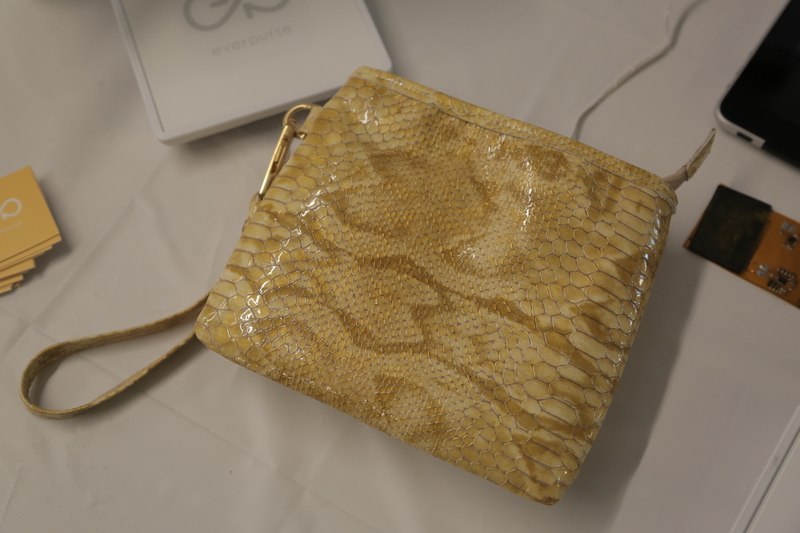 Everpurse is a tech platform that can be used to augment fashionable products. Currently that means charging your phone on the go, but it could also be used for other things. The purse works by plugging the phone into the purse and it instantly charges the phone. Later at night, you lay the purse on a wireless charger and it then charges the purse. The team plans to extend beyond its first product, as it hopes to become the tech company for fashion. They’ve created an app to enable customers to become content creators with the brand and interact with the company. It will allow customers to communicate with the company and also let users know where a purse or other accessory is located based on GSM, Bluetooth, and WiFi connectivity. The technology will also be available to anyone else who wants to build smart tech-enabled fashion products. Notch is a wearable technology API to capture personal movement and provide immediate tactile feedback. That gives users the ability to understand how to improve their movement. 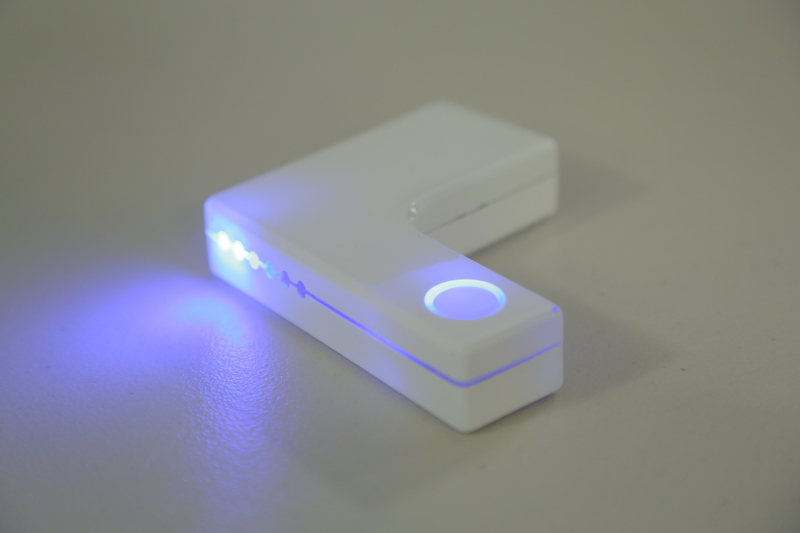 The device can be used to store and track movement data and compare how people move. Notch was built by a team of four in building electronics. Notch costs just $49, compared to $120-$130 for the most recent generation of movement trackers. With Notch, users can also connect multiple pieces of the hardware together, taking data from different parts of the body all at once. The business model includes direct-to-consumer sales, the ability to license software to developers who can build apps that take advantage of the technology. Palette is a modular hardware interface that allows users to design controllers for software, such as sliders, dials, and buttons. That takes away typical keyboard and mouse combinations to allow users to determine what how they want to control applications. Photographers, for instance, could use Palette to simplify photo editing. DJs could create their own interface for mixing music. With Palette, users can create their own sets of controls. Once you’ve arranged modules, you can then map controllers to various macros. The company is targeting photographers first to hit different industries and applications over time. Starter kits start at $99, with kits going up to $399 depending on how many different controllers users need. Dustcloud is a gaming platform to bring offline gaming online. It uses low-energy Bluetooth 4.0 modules to connect with mobile phones and allow users to fire “electronic bullets” at each other — kind of like a new version of Laser Tag. In China, gaming is becoming mobile and indoor gaming is moving outdoor. Urban gaming is growing, thanks in part to a platform called Encounter. The outdoor games are played with electronic bullets, but they have to be purchased. They have developed mobile app to connect users and make games and targets available to users. It’s a community game, so users can form teams, or alliances. Petcube is a gadget that allows pet owners to watch, talk, and play with their pets using their smartphone. With a video camera, moveable laser pointer, and WiFi connectivity, users can interact with pets remotely. The app will also allow users to record their play time with animals, and also will be able to play with available pets. Already, Petcube is available in some pet shelters, as a way to introduce potential pet owners to new pets. The app will come out before Petcubes are even on the shelves for that purpose. Petcubes will be sold for $200 retail, and in the future will offer an in-app store for pet fans to purchase real-world goods for their pets. Next May, they expect to make the box available to users and in stores. Roadie is a tuner that allows users to instantly tune their stringed instruments in a fast and accurate way. The Roadie tuner connects via Bluetooth LE, and can tune an instrument instantly without needing any help from the user. You can tune all strings within 30 seconds. The mobile app also opens up opportunities for musicians who like to use custom tuning. It also can keep track of the elasticity of a string and tell users when it’s time to restring their instruments. There are 25 million guitars shipped every year, and probably about 150 million guitars out there that need tuning, the founders believe. It’ll sell for $99, but Roadie hopes to build more tools for musicians. The bigger vision is to create a sort of “quantified self” for musicians. Vigo deals with unintentonal drowsiness by attaching to a pair of glasses and using infrared sensors to monitor user blinking patterns. The device is designed not only to figure out when you’re tired and can nudge you into alertness. It can give you feedback in how to change your routine. The device is for whenever you need to be alert. It tracks body signals and alerts you when you’re starting to snooze off — vibrations, audio signals, and a light signal. Vigo seeks to use physiolytics to track your energy and determine that you’re drowsy before you do. There’s also a mobile app to track when you’re not feeling up to snuff and to give you suggestions on when you’re most alert. WearPoint offers Tact, a wearable interface that can augment Google Glass and other near-eye displays by allowing users to control them and keep their hands away from their face. The idea is to take the control away from Google Glass, and enable users to create their own swipe gestures and map feature sets to them. The cost? $60 to be able to swipe and press buttons to input data into their device to create a variety of ways to trigger feature sets. can be clipped onto a pocket, belt, keychain, and allow the device to fit into the life of the users, rather than the other way around. But it’s not just Google Glass — nearly anything could be controlled through the same Bluetooth LE swipeable control.